Remember that there is colour variation through the terracotta caused by the firing process, this can be seen in photos on our website but may not be so easy to see from a sample tile, please keep this in mind as colour variation is an important and unique characteristic of handmade terracotta which is often immitated but never matched in machine made terracotta. 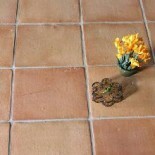 Using sealants or oils will also enhance your terracotta tiles and ensure you create a unique floor for your project and be the envy of your friends. We highly recommend that you measure and measure again when totaling up your required m2 as mistakes are frequently made, we always suggest you order an extra 10% to allow for cutting and positioning of the terracotta during laying. All terracotta will have chipping and pin holes but these are normal and are positive characteristics that create the unique character of terracotta. You can darken ( antique ) a terracotta by the use of Boiled linseed oil or an antique stone oil, the choice of finish can then be chosen i.e. an antique leathered finish using a wax or a satin or gloss finish using a range of available sealers which we stock. To keep the tiles light in shade you can pre-seal with a primer like our Mattstone and finish as mentioned with your prefered finish. The samples you would have received from us are unsealed, all terracotta needs sealing and can easily be sealed and cut using wet tile cutters using diamond tipped blades making terracotta perfect for self installation. Once the terracotta is sealed there is minimal ongoing maintenance. I was very delighted to discover this site on bing.I wished to say thank you to you with regard to this great study!! I certainlyliked every small bit of it and I have you bookmarked to check out new stuff you publish. This entry was posted on June 13, 2013 by Living Terracotta in General info.